The Borley rectory writings on the wall is one of the most interesting manifestation of the famous Borley rectory haunting, which was probably the first case of ghost hunting in history. They believed the writings had come from a young deceased catholic woman who wanted her body to be discovered and receive a proper Christian burial ceremony. 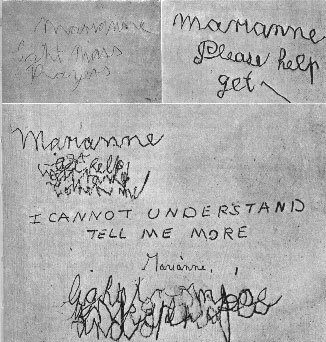 She was trying to communicate with Marianne, wife of the Reverend Lionel Foyster, the couple living in the rectory in October 1930. We can read "Marianne... please help get" and "Marianne light mass prayers". Marianne wrote that she couldn't understand some of the writings. Learn more about The Borley Rectory Hauntings. "Local legend had it that a monastery had once been located on the site and that a 13th century monk and a beautiful young novice were killed while trying to elope from the place. The monk was hanged and his would-be bride was bricked up alive within the walls of her convent."